Oil production has been always very perspective kind of business from the financial point. No wonder oil is called “black gold”. 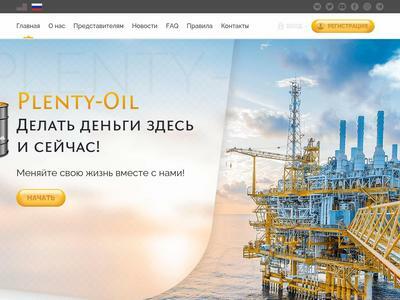 Our company Plenty-Oil specializes on investing in rich oil deposits. We are co-owners of 17 oil-wells, each of which brings more than 1800 tons of oil per year. This allows us to have an income that counts in the millions. The amount of 10 USD has been withdrawn from your account. Accounts: U4222871->U15912099. Memo: Shopping Cart Payment. Invoice 238, nelomota.. Date: 18:55 23.05.18. Batch: 215595078. 05.24.18 09:14	Account	Transfer	-200.00	Sent Payment: 200.00 USD to account U15912099 from U17755**. Batch: 215646117. Memo: Shopping Cart Payment. Invoice 484, Knjaz1. 05.24.18 11:20	Account	Receive	+0.7	Received Payment 0.7 USD from account U15912099 to account U17755**. Batch: 215656675. Memo: API Payment. Auto. The amount of 0.7 USD has been deposited to your account. Accounts: U15912099->U2631114. Memo: API Payment. Auto.. Date: 11:42 24.05.18. Batch: 215658729. The amount of 4.9 USD has been deposited to your account. Accounts: U15912099->U2631114. Memo: API Payment. Invoice 542, MYINVESTBLOG.. Date: 11:47 24.05.18. Batch: 215659121. The amount of 2.1 USD has been deposited to your account. Accounts: U15912099->U2631114. Memo: API Payment. Auto.. Date: 13:22 24.05.18. Batch: 215667408. The amount of 7 USD has been deposited to your account. Accounts: U15912099->U2631114. Memo: API Payment. Auto.. Date: 16:10 24.05.18. Batch: 215683108.